GL 40 Zapata County, Texas, USA. It has soft stems. If grown correctly, it will recompense the grower with generous displays of lemon-yellow flowers. Origin and Habitat: USA (Trans-Pecos region, south-eastern Texas in counties located below a line between Laredo to Corpus Christi), and into Mexico ( north of Tamaulipas, Nuevo Leon, San Luis Potosí, and possibly Guerrero). Mammillaria sphaerica has a relatively wide range, and even though it is scattered and not abundant. Altitude range: (0-)100-300(-1000) metres above sea level. 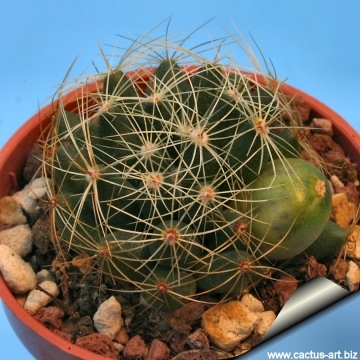 Habitat: Mammillaria sphaerica sits in thick rootstock and usually grows in shade under bushes in the Tamaulipan thorn scrub on plains and low gravelly hills. 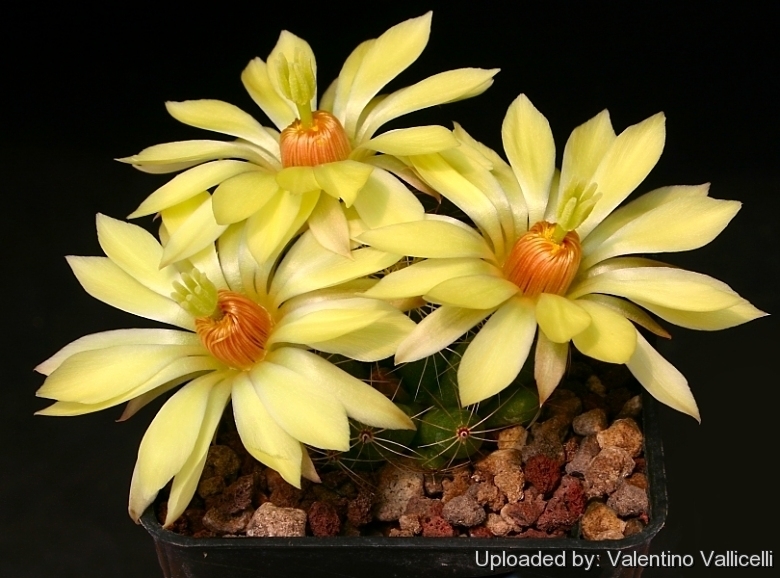 In Tamaulipas the species occurs in several sites in Tamaulipan thorn scrub, in sparse vegetation and on flat limestones together with Mammillaria roseoalba, Mammillaria heyderi, Mammillaria rubrograndis, Echinocereus blanckii, Hamatocactus setispinus, Ferocactus victoriensis, Stenocereus pruinosus. There are no known major threats to this species. 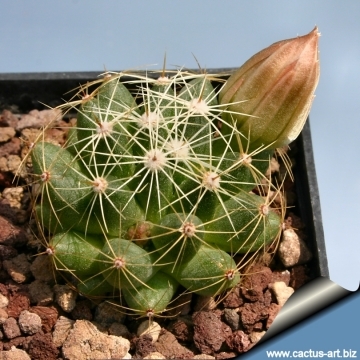 Description: Mammillaria sphaerica, best known in culture as Dolichothele sphaerica, is a small, light green sperical cactus, forming mounds or clumps to ca. 5 cm high and 5-30 cm in diameter, with 30-40 (or more) branches. Derivation of specific name: The specific epithet alludes to the characteristic spherical stems. Roots: Thick taproots, fleshy, to 2.5 cm thick, large in upper portion. Stems: Spherical, depressed-spherical to dome-shaped, 4-5 tall, (2.5)5-6(-8) cm across, light green, almost yellow-green, soft, flaccid. Cortex and pith not mucilaginous. Latex absent. Tubercles: Conical to mammiform-cylindrical, usually tapering toward apex, soft, turgid, spreading, flabby 12-25 long, 5-8 mm in diameter, when desiccated becoming much smaller, firm, and closely arranged at the base of the stem. Axils slightly short, woolly, without bristles. Areoles: Round, 1.5 mm in diameter. 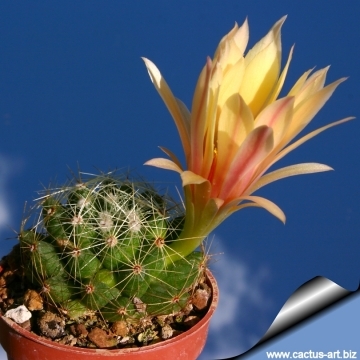 Spines: 13-15 per areole not obscuring the stem, smooth, whitish, yellowish, brownish, yellow to grey distally, glabrous. Radial spines 12-15 per areole, slender, grey, bristle-like, the longest (lateral and upper) ones 6-16 mm long, 0.1 mm in diameter, stiff. Central spines usually one per areole (reported 1-4), porrect, straight, not hooked or curved, similar to radial spines, 1-13 mm long, slightly thicker than radials (0.25 mm in diameter). Subcentral spines absent. Flowers: Broad, funnel-form, fragrant, brilliant lemon yellow, 4 long, 5-7 cm across. Outermost tepal margins entire (or minutely toothed near base). Inner tepals oblanceolate, bright yellow, paler near base, 20-30 mm long, 4.5-8 mm wide, acute or acuminate, the margins entire. Outer tepals with greenish-brown midregions and yellow margins. Filaments and anthers yellow, the stamens swirled around the yellow style. Stigma lobes eight, cream to pale yellow or greenish, 5-7 mm long. 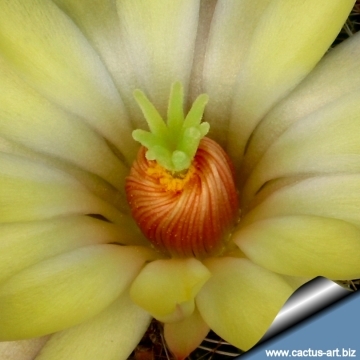 Blooming season: The plants bloom in spring and summer; fruiting May onwards. Fruits: Greenish white, ultimately turning dull pinkish tan, reddish or maroon, ovoid to short cylindrical, 10-15 long, ca. 7 mm across, floral remnant weakly persistent. The fruits are juicy throughout, and have a pleasant aroma. Seeds: Black or brown, 1.3 long, 0.9 mm broad, pitted. 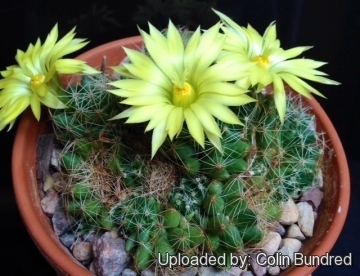 Taxonomy notes: Benson (1982) treated M. sphaerica as a variety of Mammillaria longimamma, a species otherwise restricted to central Mexico and often segregated from Mammillaria as the genus Dolichothele (Bravo-Hollis and Sanchez-Mejorada, 1991). 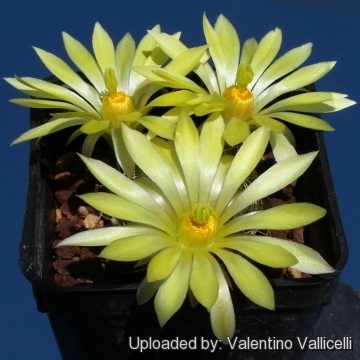 According to Weniger (1984) plants of M. sphaerica are readily distinguished from other mammillarias by their light green, almost yellow-green, stems. 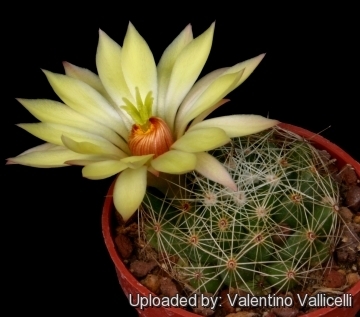 Notes: The taxonomic reduction of Mammillaria sphaerica to varietal rank within the geographically disjunct and morphologically distinct Mexican species, Mammillaria longimamma, while plausible, is still controversial. 5) Heil, K. & Terry, M. 2013. Mammillaria sphaerica. The IUCN Red List of Threatened Species. Version 2015.2. <www.iucnredlist.org>. Downloaded on 27 August 2015. 8) Benson, L. "The Cacti of the United States and Canada." Stanford, California: Stanford University Press. 1982. 9) Bravo–Hollis y Sánchez–Mejorada "Las Cactáceas de México", 1991. Cultivation and Propagation: Very easy to grow. If grown correctly, it will reward the grower with generous displays of yellow flowers. Clumps will be formed quite readily over a few years. Frost Tolerance: Light frost protection required. Minimum of 5º C for safe growing (but hardy down to -8°C or less). Sun Exposure: In spite of its preference for shade in the wild, in culture, good exposure to sunshine will favour good spine development. It can get sunburned if moved from shade/greenhouse into full sun too quickly. During the spring it may be able to take full sun until the heat arrives at the end of spring. In an area that has hot afternoon sun, it may be able to take full morning sun, but requires afternoon shade or afternoon light shade. Pests & diseases: Spider mites are especially attracted to this species, but often are controlled with overhead watering. 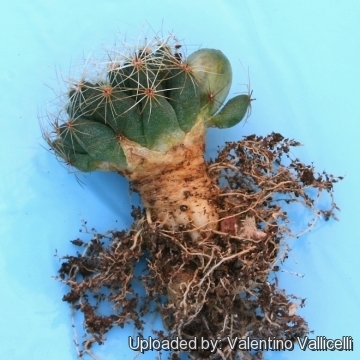 Care with repotting is needed, as the thick taproot is easily damaged.